Anything & Everything: A Post Of Feeling. 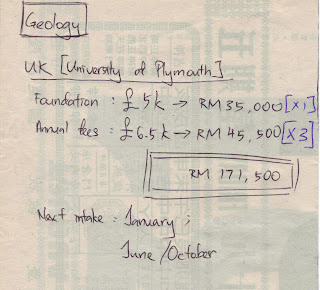 I've been through headache since the last 3 days by making decision to choose between Geology and Mechanical Engineering. Haha, a post of feeling. Since I'm aiming for a better certificate, I went to find out about those courses. Look at those expenses, die man! Foods for me, room for me, flight for me, all not included some more. This is better. Low expenses since it's a campus. Hehe, results were written at the back of calender. I know la my hand writings are bad, so don't post/come to me to insult, hehe. 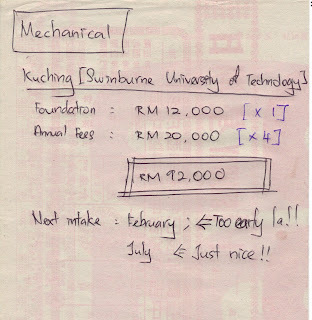 Final decision, I've choosen Mechanical Engineering for several reasons. Lazy wanna explain(you may guess, it's easy). Oh well, stay tune for more updates. 1) Written on the back of a calendar. 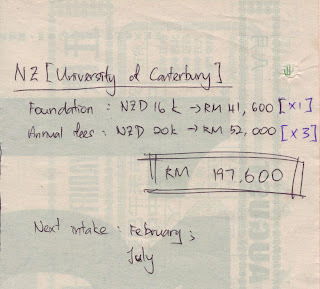 2) handwriting, sah mcm ayam. 3) All the best in what you do.